Hilda Merom, ceramic artist from Israel, was born in Argentina and immigrated to Israel in 1971. She has chosen to live in the Galilee, which is the northern part of Israel, a mountainous region with a mixed population of Arabs, Druze and Jews. Picturesque villages, Kibbutzim and community settlements nestle among the hills. Hilda lived in Kfar Vradim, a community village with a breathtaking view. One can simultaneously observe the snow-capped Hermon Mountain in the north and the Mediterranean Sea in the west. 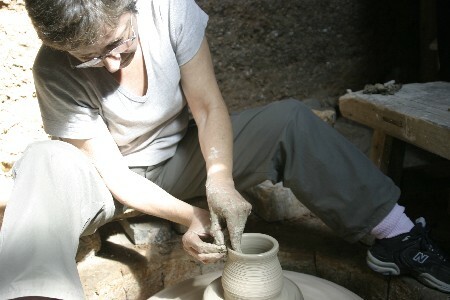 One could not wish for more inspiring surroundings or more suitable for mixing clay, throwing a pot, pit firing or saggar firing it in a gas kiln. The Israeli Foreign Ministry sponsored Hilda’s Participation in the Art in Residence Program in Sanbao, Jingdezhen, China, where she had the opportunity to work with Chinese and international artist. At the end of the residency exhibition of her work was held in the Sanbao Art Gallery. She also gave a slide presentation to the students of the Sculpture Department of the China Central Academy of Fine Arts in Beijing. In 2003 Hilda Merom was awarded a further bursary to spend two weeks in the UK as a guest of the Designer Crafts Foundation. During her stay she visited many studios and collections and also gave a slide show for a group of leading British potters including Gabrielle Koch and Nicholas Arroyave Portela.